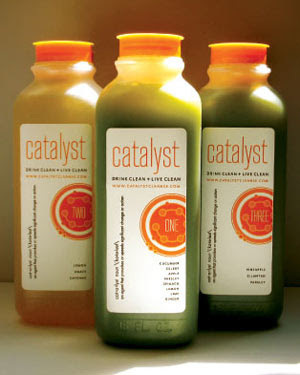 The company making the juices is called Catalyst Cleanse. They are located locally to Philadelphia at 1713 Spring Garden St. You have to place your order online or by calling and then you just pick up the juices at their location, you cannot go to the location to "shop". I had a voucher from deal of the day site, Rue La La, to get the three day set for $100. The full price retail is $180. You have the choice to juice Tues-Thurs or Fri-Sun since their pick up days are Monday and Thursday from 5-7pm. You can also have them delivered to your home for an extra charge. Kick the sugar craving, set off November on a good clean note, get my willpower out of the hole I dug and back up to 98% and start to get back to my original weight. I was not planning on hitting that til the end of the month, but as you will see it came sooner then later. I was at 122lbs back in Sept and then I suddenly fell off the nutrition wagon. I was trying to stick to my usual meal plan but it seemed like every day sugar and snacks were creeping in, particularly around 3pm on workdays. Weekends became complete cheat days both Saturday and Sunday. I ended up with a constant sugar craving and 6 extra lbs...not cool. I also noticed my skin wasn't as clear, my workouts weren't as energized and I just didn't feel 100%. When I saw the Juice deal on Rue I figured it would be a great way to kick off a clean eating November. I should mention that I already fast on Monday's, I have been doing this for about a year now.I thought I should mention it since it might give me a leg up on managing hunger vs just wanting to eat. The weights I list are my weigh-in numbers from the morning of that day. Pre-Juice: 128lbs- I took the week before to eat as clean as possible, highly suggested by Catalyst. I fasted on Monday, went high protein low fat on Tuesday, even balance of protein, carbs and fats Wed/Thurs. I did not avoid meat on the days before the cleanse as they suggested since I was already worried about the lack of protein for the next three days. Day 0: 127.5lbs - I went to pick up the juices Thursday after work. It is a shady sort of setup, you pull up to the curb, call the number they gave you and they bring your juices down to the door. I am assuming they have set up shop in an apartment or two in the building. The girl seemed nice enough, aka didn't look like she would put anything dangerous in my juice. The juices came in 3 bags complete with an ice pack to keep them cold for the ride home. Lining the bottles up in my fridge they made quite the nice colorful display...until they settled, then it was a little less pretty. They all require a good shake before consumption. Day 1: 127lbs - My theory was that I was going to get hungry living on just juice so I slept til 9, got ready for work and had my first juice during my walk in around 9:30. This meant a juice at 9:30, 11:30, 1:30, 3:30, 5:30 and 7:30. Worked great for including my noon run. This plan backfired. The juices all tasted really good, the green one is mostly cucumber with a splash of lime, the lemonade goes down fast and refreshes, carrot/apple and beet/apple are sweet and fiber full so they really fill you up, a second green juice, then the dessert of cashew milk is heavenly. My problem was drinking 16oz juices every two hours plus additional water and herbal tea leaves you FULL. I ended up not drinking my 5:30 green juice until 7pm and then the dessert at 8. I made it through the first day ok, but my stomach just felt so bloated with fluids. My mood wasn't the best towards the end of the day but I think that had more to do with a long work week, exhaustion and of course being drowned in juice. In bed by 9:30. Day 2: 126lbs - I woke up at 6am, two hours before my alarm, and had a great idea...drink a juice now and go back to sleep. This ended up working perfectly. I spread the juices out a bit more then the day before and there was no drowning feeling. I wasn't hungry at all and had all the energy I needed to play in 2 football games with no subs. We won both games of course. I spent the rest of the day cheering at a crossfit competition and going on a walking tour of Philadelphia. Energy was never an issue and I had no feelings of starving. A few times during the day food was offered to me, including some paleo sweet potatoes that smelled like heaven. They were hard to pass up, but I think I would have had a hard time if I was juicing or just trying to not eat anything outside of my meal plan for the day. Obviously a key to these three days is to try not to put yourself in situations where there will be a buffet present, willpower is only so strong. Set yourself up for success. In bed by 10pm. Day 3: 124.5lbs - Daylight savings time and early to bed meant another early wake up, so down with juice one and back to bed. I was trying to sleep as much as possible since I wanted this to be a completely restorative weekend for my body. With that in mind I got up at 8, had juice 2 and went to hot yoga. Even after two days on just juice I had plenty of energy for the class. I did add a NUUN hydration tablet to my water for the class to avoid any over dehydration, you sweat A LOT in hot yoga. After class I was exhausted and wanted a nap, but once I got to my parents house that feeling passed and I was fine. I spent the day hanging out with my family who cooked up burgers for lunch and homemade chilli and cornbread for dinner. I think this cleanse affects your sense of smell because I could smell the smallest bit of food from 100yrds away. This was tough, but I made sure my mom set aside some chilli for me to take home for later in the week and I drank my juices. I wasn't about to fail in the twilight of Day 3! Was in bed around 9pm. Day 4: 123.5lbs- The return of food...but not before my 5:45am CrossFit WOD. This is where I found the biggest con of the cleanse. My legs were super sore from football and yoga, something I am not used to and attributed to the lack of protein for recovery. The cardio parts of the workout seemed fine, burpees were flowing. However the bar felt extra heavy on push presses and pull ups were killer. Again I am thinking the lack of protein was working against my muscles. For my meals I stuck to vegetarian since catalyst suggests easing back into heavy proteins for your stomachs sake. I had apples, coconut milk, salads with oil and vinegar for dressing, brussel sprouts, mushrooms, etc. Day 5: 122.1lbs - So even with full food in my stomach the day before I woke up almost another 1.5lbs lighter. I ate eggs at breakfast and tuna at lunch and things seem ok. I did have an oatmeal raisin cookie at lunch, no one is perfect. But I am going to try hard to stay on track the rest of the week until my usual cheat day on Sunday. Also going to try to keep the no alcohol going until Dec 1st. Drinking has an adverse effect on my willpower and if I want to try to get in a full 5 good weeks I need to drop the sauce. Final Notes: Everyone asks about the bathroom situation, so here it is...for the three days of juicing I pee'd a lot. You are taking in 96 ounces of juice plus up to 96 ounces of water every day, that is a lot of fluids. As for the other I actually felt that I went less then usual which can probably be attributed to the fact that I was eating a lot less "waste" aka preservatives, add-ons, fillers. I was eating foods my body could use for energy and nothing added and I was imbibing them in a state where they could be quickly and fully digested before traveling to the "exit". However the night of Day 4 and morning of day 5 were a bit different, nothing horrible or story worthy, but my body definitely cleaned house a bit. Opinions: I definitely think this was worth the money and a weekend of my time. I now wish that I didn't have any overly physical activities planned to avoid the soreness, but I did have the energy to complete them. I feel refreshed, my skin has cleared up drastically, my sugar craving has minimized, willpower is up and of course I am back to 122lbs...we will see if that stays with more days of real food, I think it will. 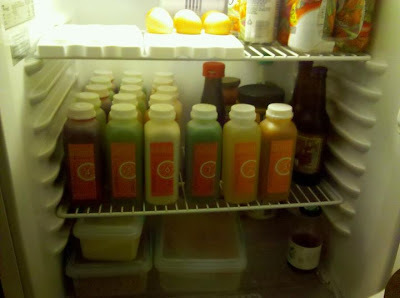 I would suggest juicing on a weekend rather then during the week, just so you have more down time and if you are Crossfitter, it can be WOD free. A friend of mine did the juice with me and while I cannot comment on her day to day status she didn't mind the taste of the juices, loved the cashew milk, complained a bit more about being hungry (she was faced with pasta party on Sunday which was rough)...but she made it through and completed a 5k race Sunday morning. Let me know if you have any other question : ) Good luck if you try to give it a go.